That sigh of relief you hear across the nation is the collective hallelujah as moms send their bundles of joy back to the classroom this fall. Preparing for back-to-school can be an exciting time of year for both parents and students, but it can also be a time of extreme stress, particularly for moms who continue to be the primary back-to-school shoppers for kids in elementary and middle school. Parents will spend an average of $501 per child on clothes, supplies, technology, etc. Market share is moving away from department and specialty stores toward mass merchants. 71 percent of all shopping happens July through August, with those who shop in July spending 16 percent more than those who purchase in August. If you want to reach parents, particularly moms with your back-to-school marketing, follow these tips to get their attention. When marketing to moms, remember that various devices are used during the back-to-school shopping process. At home, moms are browsing their desktops and iPads with their children, looking for items on their list that fit their quality and price standards. They use mobile devices when they are in store, price-checking items (60 percent) and looking for product reviews (52 percent) to make sure they’re making smart purchase decisions. Brands and retailers can support their efforts by enhancing mobile websites and phone apps with optimized images and product pages along with detailed product reviews to deliver a superior customer experience. And though they’re doing their research online, more often than not they’re still going to the store to purchase, with 68 percent of moms planning to visit 2-3 stores. 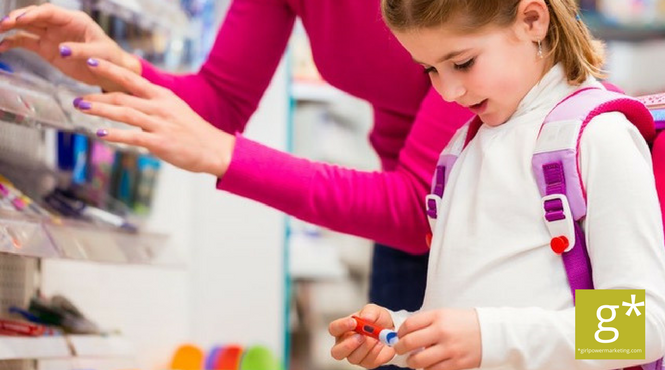 While 65 percent of moms say they shop in stores to evaluate the look and feel of a product, 48 percent admit they simply enjoy the tradition of back-to-school shopping with their children. 95 percent of moms say that back-to-school shopping causes anxiety, and this year 82 percent of moms agree that the back-to-school shopping season puts a strain on their household budget. From clothes and shoes for growing children to classroom supplies and food and snacks for lunchboxes, the amount they’ll spend can be jarring for many. To ease the pain of buying, make sure to prove your brand value. Loyalty programs play a vital role in building relationships with consumers, with 42 percent of shoppers noting that they look for stores where they can earn rewards from back-to-school purchases. Other improvements customers are looking for are faster checkouts (both online and offline), no hassle return policies, and more fully-stocked shelves. And the biggest thing shoppers are looking for: free shipping! Children play a much larger role in their parent’s purchase decisions than ever before – with their influence increasing by 72 percent over the last two years. We noted earlier the Generation Z influences up to $200 billion in spending each year, most evident during the back-to-school shopping. For clothes and shoes, 96 percent of moms say their kids strongly or somewhat influence purchases. For groceries for lunches, 95 percent say kids have a say. When it comes to school supplies, moms take back a little more control, but 86 percent still say they let their children have input, with more than three-quarters of parents saying their kids influence up to half of their purchases. Moms are busier than ever in 2017. Many are heads of household and often without a spouse or partner. Between career and children, there’s not a lot of time left in each day. These consumers and influencers appreciate brands that make finding product information easy and convenient. Studies show that consumers will consume multiple pieces of content about a brand before engaging with a brand. And while moms want all the product content they can find, they have limited time to read all but the most relevant product information before making a purchase. So be sure your product information appears on all marketing channels: your website, blog, advertisements, direct mail, and the coupon circular in the local paper. The more moms know about your products, the easier their purchase decisions will be. Many kids are already back in school around the country, but it’s not too late to put these tips into practice for your brand. If you’d like to learn more about how Girlpower Marketing can help your brand with marketing to moms, give us a call.